Jack Patterson was instrumental in establishing the Ensign Fleet, and the Pentwater Yacht Club's Wooden Boat Show and Back From the Mac Party. 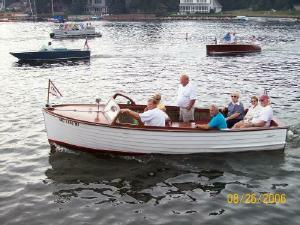 Patterson Marine provided great support for restoring and maintaining Ensigns and wooden boats. After Jack's untimely death, a group of his friends purchased Patterson Marine. We will strive to maintain the spirit of this place, while updating some of the infrastructure.